Throughout his four decades of pastoral ministry at Grace Community Church, prior to his sermon every Sunday morning, John MacArthur has read a portion of Scripture and led the congregation in a pastoral prayer. It’s a treasured part of the worship service enjoyed by all who attend. John’s family—in particular, his four children—have encouraged him to publish a book of selected prayers he has offered during Lord’s Day worship. While he had resisted the idea for many years, he finally gave in. 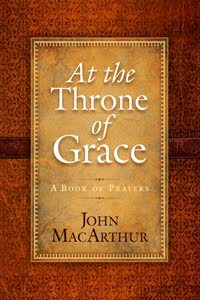 That book is now available and it’s called, appropriately, At the Throne of Grace. At the Throne of Grace is not a book of officially sanctioned prayers; it’s not a script to follow nor an instruction manual on how to pray. It is a devotional book—something you can open, even to a random page, and benefit from. And it’s yours free, just for asking. NOTE: This free book offer page expires August 22, 2011. This offer is available only to those with mailing addresses serviced by Grace to You offices in the United States and Canada.